Please consult tire manufacturers publication(s) and/or website(s) for information on tire care, safety, installation, maintenance, manufacturer’s warranty and other information. The tires used for your application must have a load index and speed rating equal to or greater than the tires fitted as original equipment. The tires themselves may be fine (have not installed yet), but I don't really appreciate buying new tires and being delivered tires manufactured 2 (front) and 3 (rear) years ago. I expect tires sold as new to be manufactured within the last 12 months. Manufacturers recommend replacing tires after 6 years from start of service regardless of wear, and at 10 years if in storage. These tires already have 20-30% of their life gone right our of the box. How would you like to get a meal at your favorite restaurant delivered to your table that the waiter has already eaten 25% of? Not so great. Dennis Kirk would not take them back unless I pay for shipping and could not arrange for newer tires regardless. Hmmm. I guess that is the price you pay for buying online sight unseen. I installed these on my 1200GS and took off on a 3000 mile trip. I install my own tires and these have stiff side walls and were a little more difficult to change. After 3K miles they seem to be wearing very well, hope to get a lot of miles out of these tires. They are very good in the twisties and work really well on gravel roads. Also drove in a lot of rain and they were fine. Very good tire I will buy again if the mileage is good. Used a set of these last year on a trip to Alaska,worked great on pavement and the chip seal.On gravel their limited when it’s wet,but better then most I’ve used.Really worked well on fresh laid chip sections.Just bought another set.10649 miles on photo set. True superior grip in the rain! I rode on these tires two up on a V strom in Ecuador. Pushed on through rain showers at altitude winding through the mountains on dirty roads for hours. Hard packed secondary roads no problem. Very impressive to say the least. It figures Freedom bike rental would only put the best tires on their bikes! Very good tire, excellent traction and neutral handling, very good on gravel or chip-seal roads. Will not mount this tire until summer on my VStrom 650. I think they will be just what I want for this bike and the service from Dennis Kirk is outstanding. 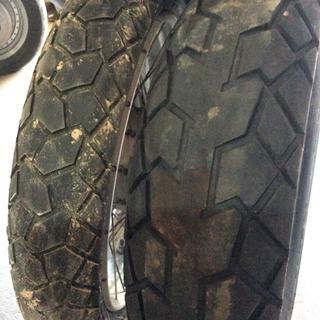 Ruined the handling on a 2007 Suzuki DL1000 VStrom. Might be something wrong with the tire. The bike feels loose. Great tire. Excellent traction and neutral handling on pavement, good for gravel roads, I haven't tried them on wet offroad. In 4.00*18 (rear) what is the inflated width? BEST ANSWER: What part number are you referring to?